This was a very special wedding for me to shoot. I found it heartwarming to see how much support there was in that reception room for these two girls. Something that resonates with me especially after watching my own sister April marry her now wife Amanda. The following is from Today’s Bride Magazine’s blog. They published this wedding in print. The spreads are at the end of the blog and the magazine is currently on shelves. DIY: Gyann and Lynda made their own centrepieces, favours, seating chart and programs to fit their travel theme. The theme was topped off with an airplane cake! Special moments: Both ladies agree that their words were the highlight of the day. 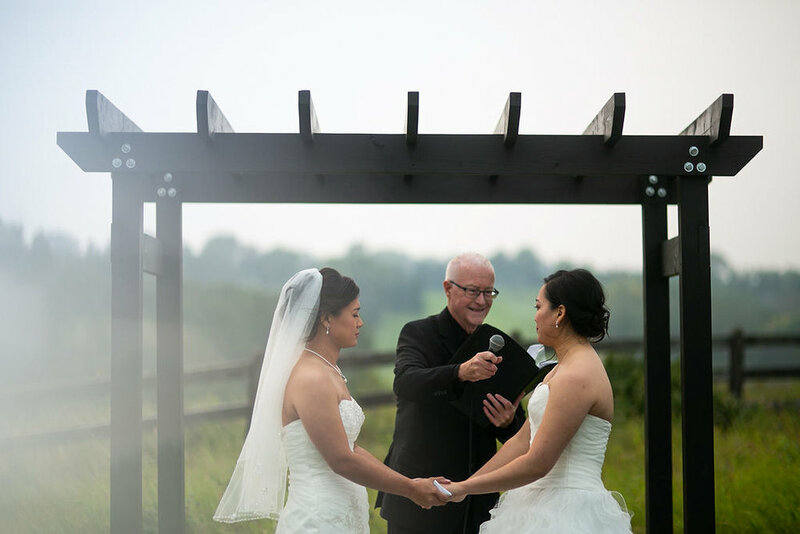 For Gyann, it was reading the pre-ceremony letter that Lynda had written to her, and for Lynda, it was saying her personal vows.